- We found a secret place, and we can even ride there. At least mom and me, says eight-year old Alexander, who last week was on vacation at Valdemar's Castle with her mother and her two younger siblings, Josephine five and little Nicholas to eighteen months. 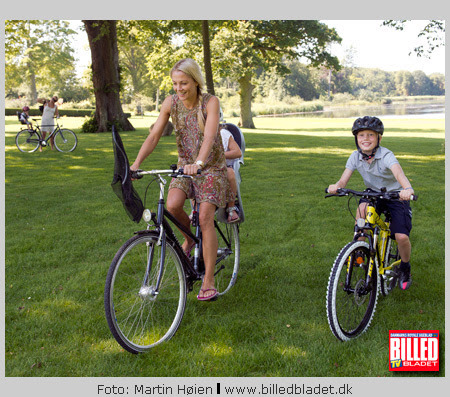 "The secret place" as close to the palace that Alexander could easily handle the ride, while Jospehine had to sit back with his mother and little Nicholas in a chair behind the baby girl Cecilie bike. 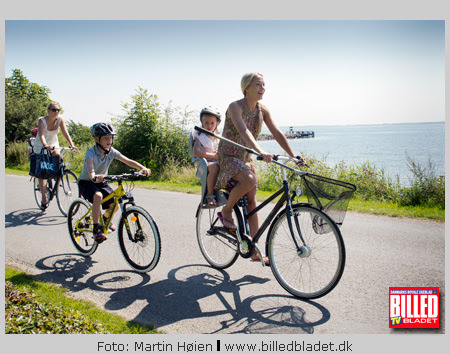 - We love summer in Denmark, says Caroline Fleming, and this week has been absolutely fantastic. Alexander has been very good at cycling, and Josephine practicing also in his little red bike. It is far more at home on the lawn. - Yesterday she drove straight into a bush, says Alexander and hurries then to add: "But she had not hurt herself, did Josephine?" 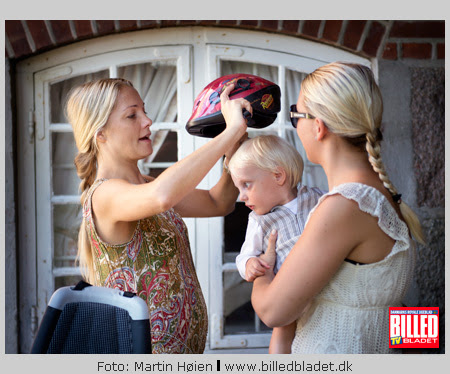 And while little sister shaking her head, goes Caroline and baby girl started to get kids bike helmets clamped attached to the kids. - When we are in Denmark, we have the bread pieces. With delicious cold cuts from the butcher. It loves children, says Caroline, while she ranks bag with all the goodies for baby girl. Even should she namely cycling with Alexander's fishing nets. - Sander has captured both the crabs and water men, and yesterday there was also a small fish in the net, says Caroline and tells us that children also have helped to feed the pheasants. Also little Nicholas, who otherwise enjoy themselves with their own outdoor playthings, standing on the lawn behind the white garden gate with a sign "Private". Caroline Fleming, who in September will turn 37 years, is the summer dressed in a short, patterned dress, slippers and hair gathered in a braid at the side. She enjoys being "home" even though Valdemar's Castle is now transferred to her father. 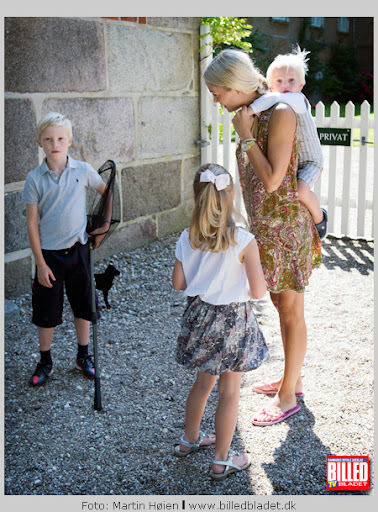 When the summer holidays in Denmark is over, take Caroline Fleming returned to London where she and the children live. She expects it will be before, the Olympics ends. - I have read that there would be so much traffic chaos in the city, but I think it is a little exaggerated, she says to IMAGE magazine. But first summer on Tåsinge enjoyed, and right now is the "secret place" where all today, a walk in the water. 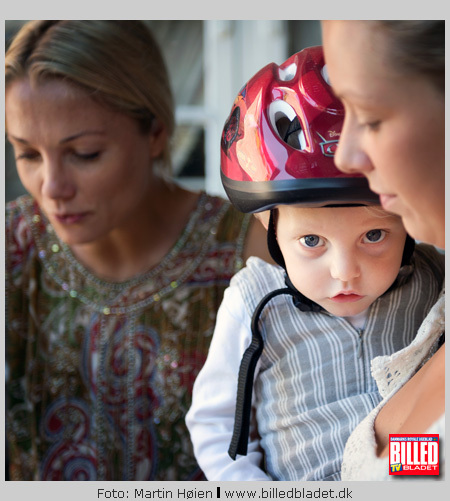 - But then we say no more, says Caroline with a smile, as she bikes pioneer Josephine back, closely followed by Alexander and the back a little perplexed Nicholas with a red helmet on the baby girl's bike. 1) is she still pregnant, or is that the dress in Photo # 2? 2) is she wearing Marie's dress, or do they have the same one? It's nice that they choose to do outdoor, adventurous pursuits and that they can do them in private. A child's dream holiday really. Did Caroline ever divorce Bond, Money Bond husband to marry Lust, footballer Lust at all?? I think she and footballer broke up some time ago. She looks great - but you should hear her talk. I don´t think she is nice at all. Snobbish, exalted, unfriendly to people she considers "below" her, fake. Just a dumb bimbo, in my opinion. hmmm...sounds like her best friend/Mosh's personality too, to me. Caroline was featured in the NY Times. That's way more exposure than Mosh has ever gotten in a prestigious US publication. It's a fluff piece, of course. But still. Mary doesn't get that even when she's trying to be a do-gooder at the U.N.
Caroline Fleming certainly isn't trash. That's quite true so it's baffling that she would participate in a show that is intrinsically trashy and conflict-based. This is the London version of the "Real Housewives of..." franchise from the US which sports physical violence, drunken verbal clashes, vulgar displays of wealth without taste (bogan with a capital "B"), staged battles, and greedy grasping low-goal social climbing. It's an Amber show, not a Caroline Fleming show. It genuinely begs the question as to why someone of her caliber would sign up for it. Does anyone know why? She mentioned in an interview, or even on the show itself (don't remember) that people thing she got a lot of money from the divorec, and she didn't. She continued that she was a single mom of 3 children, who is responsible to support them. She also seems to have fallen out with her family and doesn't get along with her step mother. They think of her as the black sheep of the family, and stood by Nicklas Bendtner when she and him divorced. It's sad and even shame that her family didn't support her with the divorce but still, noone's personal story is a good excuse for taking part in a reality show. Unless we're talking about people who really struggle with paying the bills and don't have a job etc so the money and the exposure through the reality tv can assure food and a house. She shouldn't participate and she knew it. We can't prove anything this way, no matter all the difficulties in our life. She could write a book that could turn into a series, way better than a cheap reality tv show. ?400m seems like a lot of money to me. She divorced Rory Fleming, she and Bendtner weren't married. I suspect her family didn't approve of that relationship either, as Bendtner is quite a character. Her family is very stiff upper lip and by all accounts Caroline isn't. I guess they all had different ways of dealing with the trauma her mother dying so young clearly was. They are also struggling financially with the upkeep of the estate. She herself said she did not receive the amount of money the press wrote about: what is known as facts is that her exhusband has poured money into the estate, presumably because their oldest son is the heir. Caroline herself is clearly hustling, I can't blame her for that. She's working to make money in various ways and while the show is trashy, she comes across as anything but compared to the other women. She is in it to highlight her brand and it shows IMO. She isn't the only one of them doing so either - the woman married to the future Earl of Sandwich is to and has even told the DM so. The difference is that Caroline does a much better job at promoting herself.